Regarding real fur. I say no to fur pompoms on beanies or bags decorations. They are really useless. If you do not live in a country where it is freezing cold, then you also probably do not need a real fur coat at all. If you live in a super cold country and you want to buy fur to keep you warm (but there are also synthetic options for this purpose), remember that fur is meant for a lifetime. It would be a shame to buy a fur coat and toss it the season after… It is also possible that your grandma donated you a cool fur coat or that you already bought one. Since it is here anyway, figuring out what to do with it can be useful. Now let’s see how to be stylish! Long hair, short hair, curly hair, they are super diverse and cool in a different manner. And with faux fur, you can even have incredible effects and colors that will make you look like you belong to a virtual fashionable specie. When you buy faux fur, avoid the ones that look polyester shiny. You know, like a cheap wig. They are quite tacky. 2. What length for the coat? The shorter fur coats look funky, the mid length ones look classy, the long ones look super dramatic (personally I do not like those). Choose yours according to your style. 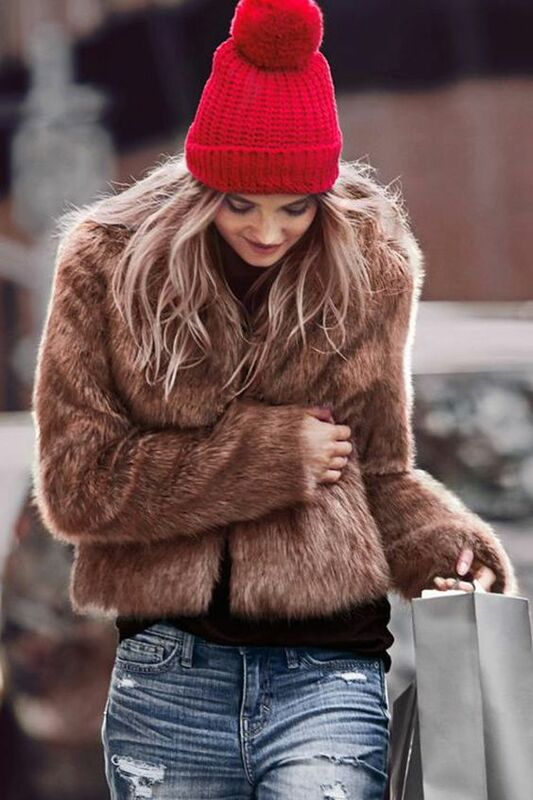 The beanie of this (so american looking) girl from the Abercrombie lookbook makes her short coat even more cool. The barefoot blond with a très chic style starring a mid-length coat. Loving the color mix! 3. To scarf or not to scarf? Searching for the entry “fur coat”, about 90% of the pics you’ll find will not feature any scarf. I must admit that the “I am almost naked under my fur coat effect” is quite stylish. French actress Dominique Sanda, really naked under her coat in Une chambre en ville by Demy. Problem: if you are wearing fur, it probably means you are cold. If you are cold, you probably want to cover you neck. So a scarf would come in handy. For me, the texture of it shall look “rich”. I recommend cashmeres (like in the barefoot blond pic), pashminas, silk or wool. 4. What style with it? A casual very simple style is great, making the fur coat the star of your outfit. As most fur coat are fluffy, jeans that are skinny on the hips will look very nice to balance the silhouette. You could pair them with some low boots, sneakers or masculine shoes. It is also a great way to be sure not too look frumpy. Super low key all black outfit with a fur topping. By the Sartorialist. Funky accessorizing here with a printed T-shirt, a tied Hermès like scarf as belt, and loafers with rolled hem. A classic. The “naked under your coat” effect again. The lighter and the more delicate the dress, the best it works. You are guaranteed to make quite an impression when you arrive at your party. Pair with beautiful heels: boots, low boots, pumps or sandals. The preppy style can be tried. It balances the frilliness of the fur. Same for the tomboy style. Voilà! Have fun with faux-furs! Hi… reading your blog about real fur versus faux fur, why on earth did you not mention the ethical aspects of wearing real fur ? And before you think I am a tree-hugging vegan, I can assure you I am not. Have you ever seen footage of the inside of a mink fur farm ? Do you even know how angora is sourced ? 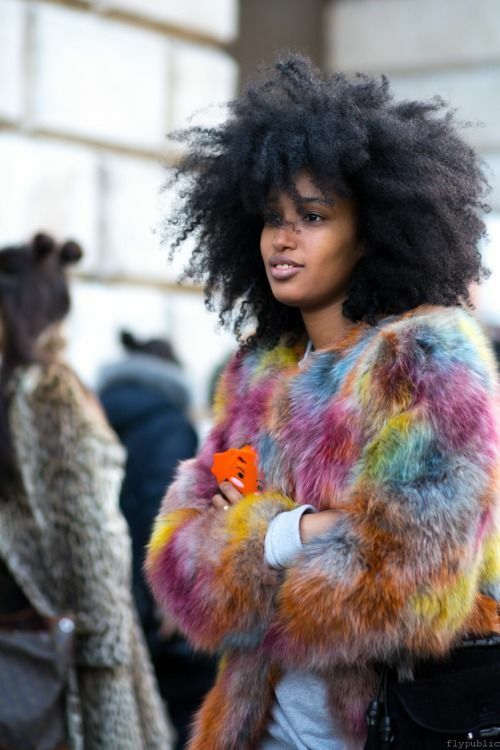 Apparently not – seems that your thoughts are more engaged in the ` scarf with a faux fur` dilemma ! Sorry, but had to get this off my chest ! I kind of said that I really recommend faux fur, which is obviously because I think there is a lot to say about the fur industry, but my readers and clients are grown ups and I let the choice up to their convictions. I am sure no one can ignore the way fur is made nowadays (and yes I have seen those footages) so… But we also do not ignore how foie gras is made and it is still customary to eat in France. And even meat. Love your blog and read every article. I have a dilemma I hope you could help me with. Last christmas I recieved the most beautiful pearl necklace from my grandmother, and I want to wear it often. (It’s the completely classic style – short and only pearls). Trouble is, as I am only 18, and although I have a romantic spirit, they make me look a bit – as you put it – “mumsy”. Do you have any tips on how to style the necklace? My figure is pretty much like an hourglass and I am of medium height. Sounds like a good lookmaker topic! Ravie de vous retrouver! J’aime beaucoup la fausse fourrure! J’ai trois manteaux, un écru, un bleu marine et un noir. Contente de constater à la lumière de votre article que je ne fais pas trop d’erreurs en les portant. J’avais un doute sur l’écharpe ( je suis frileuse et c’est indispensable pour moi en ce moment), merci de m’avoir éclairée. thank you for bringing up this one! It was a good read, despite I felt it was a bit short and missed some things I considered important. Fur coats speak freezing cold to me. Really freezing cold. So this is a winter only item, and not to be paired with anything flimsy, no rolled seams, no loafers, no bare skin. Everything else looks at least costumey. Scarf: rather go without and choose a turtleneck top instead, or maybe even pair it with a fur stole tucked inside the coat? Style: fur coats speak expensive luxury, and nothing but this, so paired with preppy items looks quite off to me (but this is personal, too – it just resembles the “borrowed from my classy mom because I want to look classy like her, but couldn’t make it and now look ridiculous”). 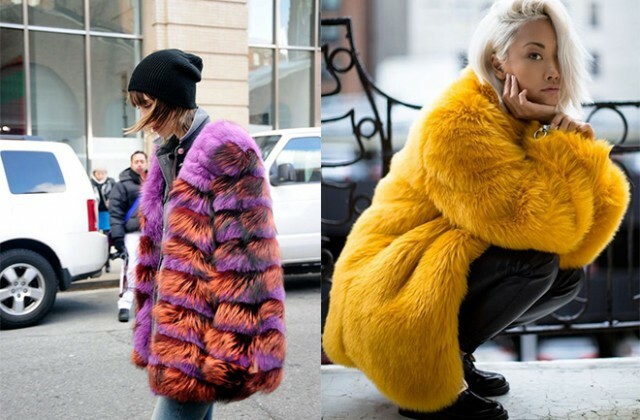 The (multi)coloured, very fluffy ones are very on-trend and won’t last more than a season or hopefully two, so I’d really think hard about investing in it. I completely agree: don’t choose the plastic version. What I was expecting, but didn’t quite get from your article, was the effect/style of different coat lengths paired with different pant/skirt options. I’d personally suggest balancing out the (more or less boxy, but always visually heavy) top with slim bottoms, figure-skimming skirts and the like. I’d suggest simple, basic styles for bottoms, as the coat already has a lot of texture and draws all the attention. I also expected a dive into the different effects of different fur types or hair lengths (e.g. long ones – more boho, etc) or at least a bit of illustration by pictures. Handbags: I’d say choose very basic, minimal ones that would keep the attention on the coat. 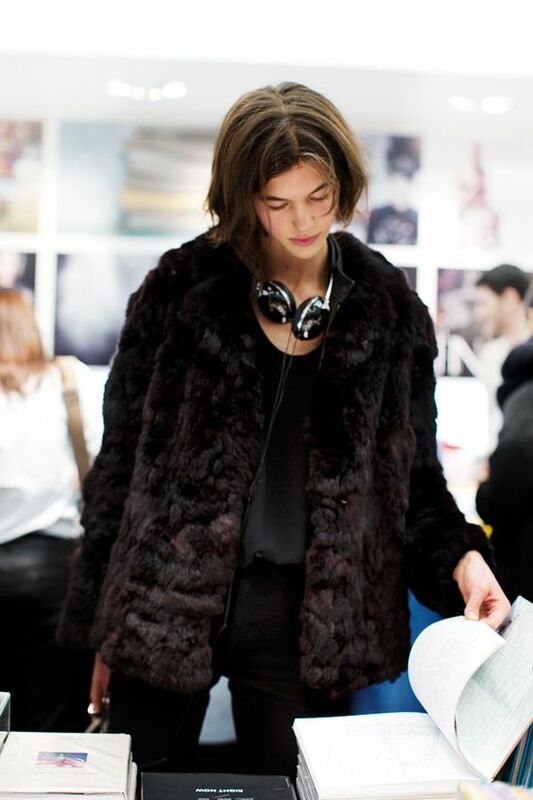 Necklines: all fur coats I’ve seen so far (which is quite a massive amount) have close-to-the-neck round necklines. These don’t suit a lot of women, so leaving it open is the only remaining option. As I mentioned above, leavin it open doesn’t acquire my eye’s taste at all. Here in Austria, we also use the term “Tussi”, which transletes into “bod, bimbo, bird” to describe persons wearing furry coats. Maybe you’d consider this when thinking about it as well. If THIS item isn’t paired really stylishly, I’d rather recommend steering clear of it. I’m sure you’ve got plenty of other coat options to choose from. And think scarf work pretty well according to the pic from the barefoot blond and Maja Wyh. J’ai beaucoup aimer votre avant-dernier post : comment jongler avec les rappels de couleur que j’ai relu plusieurs fois en votre absence. Voius annonciez un autre post sur : manier les touches de couleur… différentes! Welcome back and glad you had a wonderful trip. I have travelled extensively in both New Zealand and Indonesia and both make for a good holiday. You have picked some lovely jackets for your post and I would be happy to wear any or all of them. Also wearing a scarf would always be my daily choice in the winter regardless of the outfit. I’m so thankful that you solved the scarf dilemma! I get cold so easily around my neck and cannot imagine not wearing a scarf during the cold season unless I’m wearing a turtleneck.